Of course you've read the Percy Jackson books. You, have, haven't you? On the off chance that you've missed them, this exciting middle grade series is full of adventure, friendship, and ancient Greek gods reinvented for the modern world. The books have been so popular that two of them (The Lightning Thief and Sea of Monsters) have been made into major motion pictures, complete with fantastic special effects. All self-respecting Percy Jackson fans know that the next book in the Heroes of Olympus series, The Blood of Olympus, will arrive in their hands on October 7, 2014. What they don’t yet know, but are about to find out, is that starting early this summer, a new fleet of the original Percy Jackson & the Olympians series will pop up in stores, sporting brand-new, reimagined covers. Even better, when these new paperback books are lined up side by side by side, they will reveal one amazing panoramic mural, the handiwork of artist John Rocco, who’s illustrated all the Percy covers since the first rejacketing of The Lightning Thief in 2006. Even though the books won’t be available until early summer 2014, we won’t make the fans wait that long to feast their eyes. Starting Monday, February 17 (Presidents' Day), the Percy Jackson Facebook page will be revealing the new look, one book per day. Five days. Five brand-new covers. Don't forget to check out the Percy Jackson Facebook page every day this week to see the new covers--and the mural. 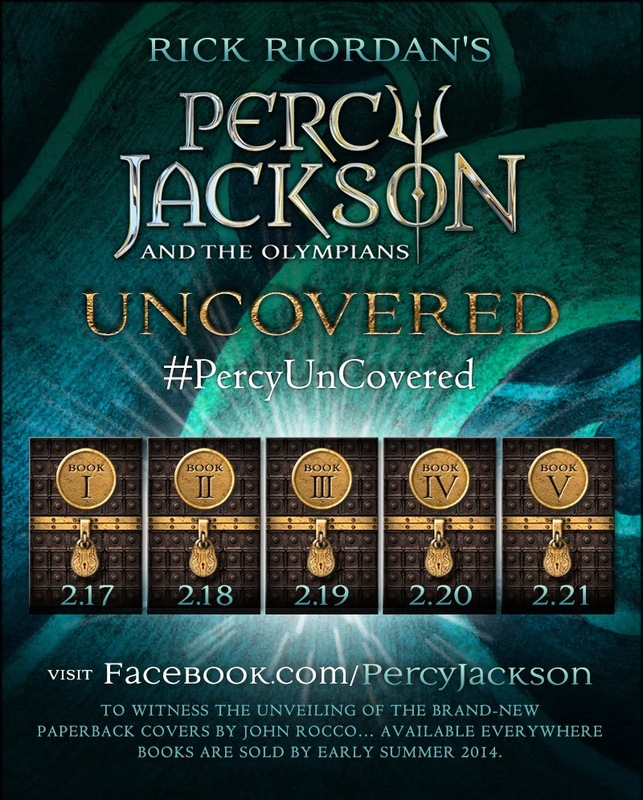 For more Percy Jackson news, follow the #PercyUnCovered hashtag on Twitter. Don't tell anyone but I haven't read those books yet. Vance listened to a few of them and liked them a lot. I keep meaning to read these books but haven't gotten to them yet. But I know kids just are addicted to them! I have the first four with the current covers. Looks like I need to pick up the 5th one soon so my set has matching covers. Hate having a mixed set. It has been a long time since I had the opportunity to read middle school books. You make me want to give them a try. How fun!! I've listened to the first two books and enjoyed them but keep forgetting to go back to listen to the others. I still need to read these books! I have the first book on my shelf and hope to finally dive in soon!